The first set of second round matches were playing at the Mutua Madrid Open on Monday. 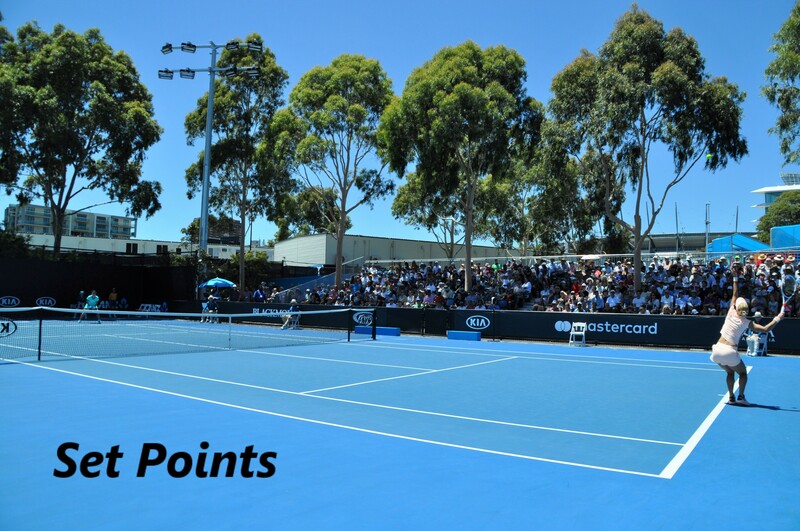 This post covers most of the matches including recaps of the matches that I watched – Garcia-Martic, Goerges-Arruabarrena, Stephens-Stosur and Pliskova-Azarenka. Read on for 9 stories from day 3 of main draw action in Madrid. Caroline Garcia found her forehand in the nick of time to halt a surging second set comeback from Petra Martic. Garcia had led 6-3 4-0 and even had a break point for 5-0 (!) in the second set. Martic reeled off five games in a row. Two points from losing the set, Garcia regrouped and won the last three games to secure a 6-3 7-5 victory. The serve, which she won 11 straight points on to start the match, and the forehand were mostly potent for CarGar. I was live scoreboarding for this one where Caroline Wozniacki needed three sets to get past Ash Barty, winning the last four games of the match to prevail, 6-2 4-6 6-4. Barty had a break point deep in the third set that would have seen her serve for the match. Another good win for Woz. A shame that Ash couldn’t take it at the end but I have no doubts that she’s going in the right direction. It was nice to see such respect between the pair at the net. Wozniacki was glowing in her praise of Barty in her press conference. From a set and a break down, Julia Goerges transformed her game to win 11 of the last 14 games and beat Lara Arruabarrena, 2-6 6-4 6-2. This was a huge turnaround from Goerges who was completely out-of-sorts at the start of the second set with a treasure chest of unforced errors. At the same time, Arruabarrena was playing at a decent level. The turnaround was all Goerges as she suddenly flicked a switch with big serves, big forehands and nuggets of neat touch. It was a festival of forehands in the final two sets from Goerges who hit winner after winner from that side. It was encouraging that Goerges somehow found her level from nothing and she ended the match playing really, really well. Sloane Stephens was in good form as she swiftly dispatched Sam Stosur, 6-1 6-3 in 74 minutes. To be honest Sloane didn’t have to do a great deal in the first set as Stosur struggled to find her rhythm and was ineffective up at the net. Stosur improved in the second set… and so did Stephens! Finishing with a string of potent forehands, Stephens advanced to the last 16 of Madrid for just the second time in her career.
.@SloaneStephens puts together a strong 6-1, 6-3 performance to defeat Stosur. Seven is the magic number. Karolina Pliskova went 7-0 in three set matches in 2018 (via WTA Insider) and extended her winning streak to seven too with a 6-2 1-6 7-5 win over Victoria Azarenka in the last match of the day. The third set was really compelling, so much so that I stayed up for it on a school night. Pliskova was awesome in the first set and hit with impeccable depth. Her game though careered off into the abyss in the second set with double faults at the worst times and a surprisingly large tally of unforced errors. The Czech player regrouped at the start of the decider and secured the first break with a sensational return winner. Azarenka clung on with a mammoth hold to get on the board and then levelled up, finding her backhand down-the-line and more opportunities to come forward. There was very little to choose between the pair at the end as Pliskova staved off four break point in what proved to be a crucial game at 5-5. This was a biggg win for Pliskova considering her rollercoaster-like performance. For Azarenka, I only see positives. So happy she’s back. Karolina Pliskova remains undefeated in three-set matches in 2018 (7-0), beats Victoria Azarenka 62 16 75 in 2h6m to advance to the third round for the first time @MutuaMadridOpen. A good article here about Petra in Prague and adapting to the new conditions in Madrid. Petra plays Monica Puig in the first match of the day on Tuesday. Petra Kvitova reflects on her triumphant homecoming in Prague and how she’s feeling after 6 matches in 6 days. The second set of eight second round matches will be played on Tuesday in Madrid including Halep vs. Mertens, Konta vs. Pera and Svitolina vs. Suárez Navarro. Polls linked below and thoughts about all eight matches up on the separate page. May 7, 2018 in Madrid, Set Points, WTA. Yep it’s been quite a run. Last night vs. Vika was so close at the end and I kind of thought Vika would edge it. The win vs. Ostapenko in Stuttgart was also noteworthy for me. Who are you thinking are the contenders to win? Even though Caro lost her lead against Martic (credit to Petra for digging in and playing more aggressively when the opportunity arose), I feel like her game is SO well suited to Madrid. George’s will be a tough test though. Well I had Ostapenko as my champ pre-tournament! I think there are so many contenders. Halep and Kvitova from the top half for me as both seem comfortable in Madrid. I think the winner of Garcia-Goerges will make SFs. The bottom section of Sharapova-Mladenovic-Bertens-Wozniacki is fascinating to me – can’t call who makes SFs there! Watched one of Mertens matches last week, and her game involves giving her opponent a different ball on each shot. Mertens alternated top spin, slices, drop shots, cross court to each side in a planned method to make her opponent hit a different shot each time and run from side to side. Will Mertens have enough time to employ her game against the big hitting Halep? I don’t think so…Halep wins. Match starts in 1/2 hour. Yup. I like Mertens, very stable game & nice person too. Petkovic wins over Bouchard in walkover??? ?